Chicken drumsticks. Chicken breasts. Chicken wings. Your flock of backyard chickens, clucking happily in their chicken coop, looks like a roaming buffet to a wide range of different poultry predators. Common predators who would love to take a sample taste of your hens include raccoons, snakes, weasels, rats and hawks. Even in suburbia, your chickens are not safe from neighborhood dogs or playful cats. Are you doing what’s necessary to protect your backyard chickens from hungry predators? Protecting your chickens from predators begins with proactive measures. The first thing you should do is remove all potential hiding spots in and around your chicken cages, chicken run and backyard poultry coop. For example, mow down long grass, cut back the shrubs and vines, and remove piles of lumber and other junk. The idea is to remove the places that predators like weasels like to stalk from. 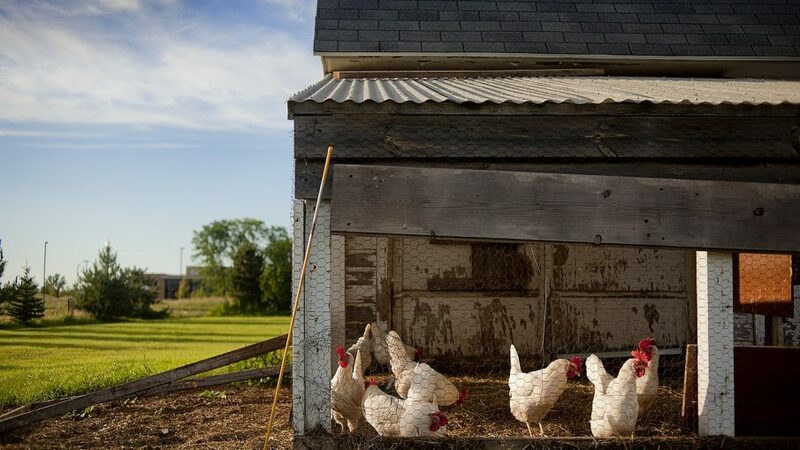 Most chicken predators don’t like to travel across large open spaces, so clearing a wide berth around your chicken flock’s coop will be a great deterrent. Also, rodents such as mice and rats are always on the scout for new accommodations and that stack of wood boards in your yard is a prime spot. Get rid of it before the predators move in, and you won’t have to deal with removing the predators later. If there is one thing you can do in your war against poultry predators, it’s keep things clean and tidy! Chicken predators will often go to great extents to get to your chickens. A fence, even a woven chicken wire one, can easily be dug under by a wily weasel or raccoon. If you have fences, submerge at least two feet of plywood along the edge of them to prevent predators from digging under it. If you’re living on a tight budget, use sturdy wire instead of plywood (which can be quite expensive). No matter what you incorporate, be sure that it’s stable by attaching it to the fence posts with either thick cables or nails. Barbed wire strung along the top of your fence will successfully deter anything that tries to climb over it. If you want to keep your poultry flock extra safe, use up to 5 strands of barbed wire strung within a vertical inch of each other. Unfortunately, all this wire can make your yard look like a prison camp. What about rodents like rats and mice? These evil creatures reproduce like rabbits, their cuter and chicken-friendly rodent cousin. Rats and mice will invade every nook and cranny of your property and have a wonderful ability to eat every single egg in sight. Rats and mice will also take a big bite out of your chicken feed (and truck the rest away to God-knows-where). If all that wasn’t bad enough, rodents are often the way that diseases spread. In a thimble, rodents are horrible little monsters with one mission: Create havoc! To discourage them, try to eliminate their hideouts. Lift up boards and bricks, look under un-used equipment, check in that pile of old feed bags…you get the general idea. Like most predators, rodents hate open spaces, so if you’re trying to find them always first check those less-frequented spots on your property, especially places where there’s plenty of junks and scraps. As noted earlier, rats and mice will take up residence in piles of junk. Keep things tidy! To make your property less appealing to the voracious appetites of rodents, store your poultry feed in tight containers (preferably metal, but anything is better than nothing). To further discourage them, and to element current rodent problems, use the old and trustworthy feline method. A cat can do miracles for any rodent stricken farmer. If you’re cat is pulling a Garfield and not doing anything, or if you don’t want a loving and funny feline companion, buy traps or find some poison at your local hardware store. Ignore those popular “ultrasound boxes” that you see in mail order catalogs…they’re outrageously expensive and don’t always work satisfactorily. As for poisons, get either the single-dose cholecalciferol (Mouse-B-Gone and Rampage) or the multi-dose solutions such as Furmarin, Paracakes, Warfarin, Ramik or Rozol. These are all safe for your flock, unlike bromethalin, Hawk, Havoc, Ropax or Contrac. As you battle the encroaching predator army, remember to always be safe! Keep ALL poisons and traps out of the reach of children and pets (including your poultry). Nothing is worse than taking out old Fido while trying to catch that pesky hawk.